HomeNeedle Tools and Slotted Tools : Which Quilling Tool is Right for You? I’ve written a before about what quilling tools I prefer, but I’ve never delved really deeply into why. But lately, I’ve gotten a few comments and emails with questions about quilling equipment. 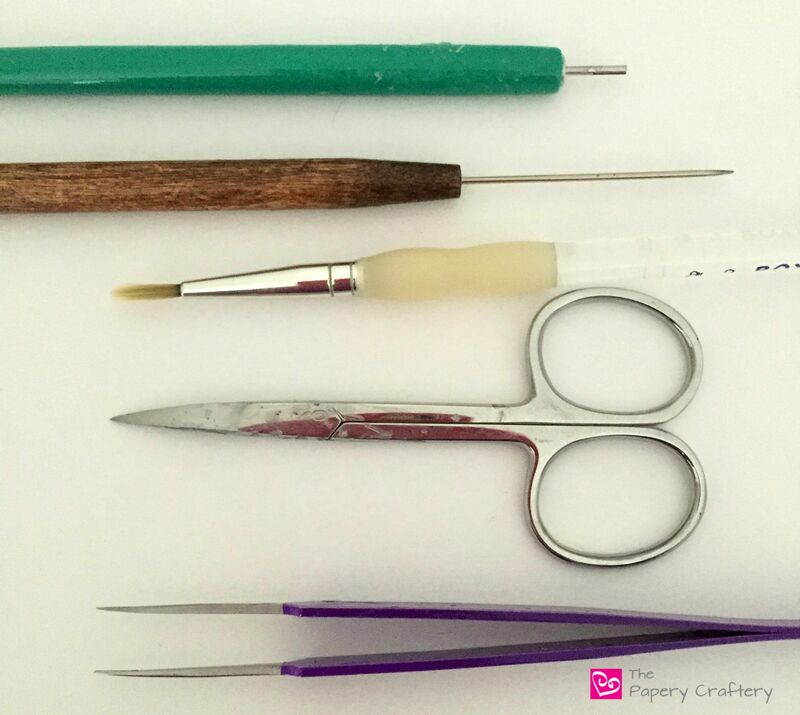 And since there seems to be lots of questions about needle tools and slotted tools, let’s talk specifics about which quilling tool is right for you! Although there are a few other alternatives, most paper quillers use either a needle tool or a slotted tool to roll their paper strips. Both tools are essentially made up of a handle with a thin, metal attachment on one end. The main difference is that while the needle tool has one long, pointed rod. The working end of a slotted tool is shorter with a slit through the center. This slot in the metal holds the end of the paper strip as it’s being rolled. A lot of quilling paper artists find this to be a huge benefit of the slotted tool, especially when first learning the craft. Once the end of the strip is in place, turn the tool so the strip continues to wrap around the end. Since the needle tool does not have slot to hold the end of a strip of quilling paper, it is up to the artist to keep the strip on the tool when rolling it into coils. This might take a bit of practice. One tip is to moisten the end of the strip slightly, then use your index finger and thumb to roll the strip around the needle, holding the tool still. Both tools will result in similar finished coils. The main difference in the coil made on each tool is that the slotted tool will leave a tiny bend in the very center of the coil. Some quillers don’t mind that at all. I prefer the cleaner look of those coils made with needle tools. Besides rolling the majority of my quilling shapes, I also find that I use my needle tool for other uses. I use it to smooth my glued edges and to slightly stretch my coils. My needle tool is essential in making swirls made from multiple strips of paper. One of the best pieces of advice that I can give to a newer quiller is to try a few different tools. There are kits that include both, try them to see which you prefer. Or try a dual ended tool. I’ve never used one of these tools, so I can’t speak from experience how they work. I can imagine that the end that is not being used might aggravate the palm of your hand when you are rolling lots of coils in a row. But, if there are any quillers who have tried one of these tools, I’d love to hear your thoughts! Do you have a quilling tool that you prefer? Or are you using your quilling tool in unexpected ways? Tell us about it! Leave a comment below and share your thoughts! I have tried many times to just use the needle tool but I’m always left frustrated. I like my slotted tool! It’s much faster for me. I also recently bought a double ended tool on Amazon (“MU purple double size volume pen…”) and I’ve found it to be VERY useful. One end is quite a bit larger which might be used for beading or something, but the other end is smaller. The smaller end is still bigger than the original slotted tool and I use it when I glue two strips of paper together so I can roll them together easily. I’ve used it a LOT for my dual-colored Christmas trees for cards this year. No need to offset the paper strips to roll them together since only one strip can fit in the original slotted tool. So glad I got it! I actually meant when i glue one strip on top of another strip to make two layers, not end to end. It makes a thicker strip that is too thick to slide into the original slotted tool, but not for my bigger tool. It’s handy. I tried the needle tool for that too but two layers of paper was too stiff for me to make it look good so i took a chance on the bigger tool. Ah, got it! While I use them constantly for outlines or as straight lines, I’ve never been able to roll double-layer strips at all. Mine are always messy in the end. Another reason to look into new tools! I find that using my tweezers to make coils works best for me. It give me a tight hold on the center of the coil without the funny crease the slotted tool leaves. In addition, after I’ve put the coil in a “hole” on the cork board to relax, I have the tweezers ready to go to remove it, glue it and then shape it. That’s a great trick! I’m going to have to give it a try!